The USS Holland (AS-32) keel was laid on 5 MAR 1962 at Ingalls Shipbuilding Company in Pascagoula, Mississippi. Designed as the first submarine Tender to support Fleet Ballistic Missile Submarines, Holland was commissioned on 7 SEP 1963, just one year, four months and four days after being laid down. Holland's first commanding officer was Captain Charles W. Styer, Jr.
After fit out and shake down, Holland sailed to Guantanamo Bay for training then took up station in her home port of Charleston, SC in November 1963. USS Holland spent April to November 1964 in Rota, Spain tending the "Boomers", then returned to Charleston. 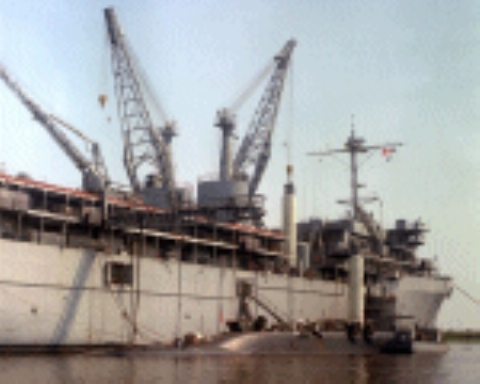 USS Holland spent the next 12 years home ported in Charleston with brief voyages along the East Coast and an occasional deployment to Rota to relive a Sub Tender needing maintenance or dry docking. In 1975 USS Holland moved her home port to Holy Loch, Scotland. She remained there until January 1982 supporting the Cold War "Boomers" operating in the North Atlantic. After overhaul in Charleston SC, USS Holland sailed for Diego Garcia via the Suez Canal. Spending June to September 1983 supporting the US Fleet in the Indian Ocean, Holland returned to Charleston via the Panama Canal completing an around the world voyage. After spending 1984 to 1992 home ported in Charleston SC, USS Holland steamed for Apra, Guam, her new home port, arriving 12 Jun 1992. Holland then passed nearly four years supporting the "Boomers", and any other fleet unit as needed, from her Guamanian station. USS Holland was decommissioned in Apra, Gaum on 13 APR 1996. She was subsequently laid up at the Naval Inactive ship Facility in Suisun Bay, California. The third Holland was launched by Ingalls Shipbuilding Corp. Pascagoula Miss. 19 January 1963; sponsored by Mrs. John a. Stennis wife of U.S. Senator from the State of Mississippi delivered to the Charleston Naval Shipyard Charleston S.C.; and commissioned 7 September 1963 Captain Charles W. Styer Jr. in command. Holland departed Charleston on 14 October for shakedown training at Guantanamo Bay Cuba returning to Charleston on 19 November. She commenced post-shakedown availability on 25 November. While Holland is neither a submersible nor a combatant ship she will be a vital link in support of our Nation's first line of deterrance- the Navy's Polaris Weapons System. She is capable of making any submarine repair other than major overhaul including servicing and maintaining the nuclear power plants of Polaris-firing submarines. The opening of 1964 found Holland at Charleston S.C. making preparations for deployment to the Polaris replenishment anchorage at Rota Spain. She arrived Rota 1 April and relieved Proteus (AS-19) as the FBM submarine tender shortly thereafter. Holland continued her vital service to the Polaris submarines until relieved 4 November 1966. Holland arrived Charleston 22 November. There she tended submarines of the Atlantic Fleet into 1967.